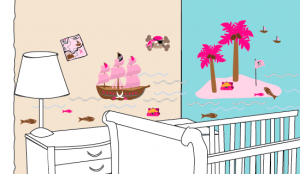 Just released – latest wall decal designs! Aye, matey! I'll be likin' these pirates. 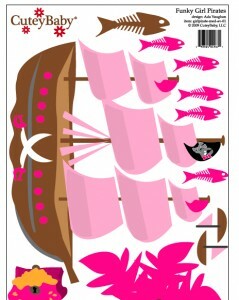 So fun – girl pirates are now loaded on Amazon. Loved doing this design. It will be going into Zola’s room. What’s not to love? Boats, buried treasure, palm trees? Adventure on the high seas! Get to Work! with these new trucks. Leanne’s Big Work Trucks One and Two are absolutely inspired. There is nothing out there like this for little boys – they are fantastic. You get everything from cement truck to hauler to police car. And in her wonderful illustrated style. Work trucks 2 - the expansion kit! 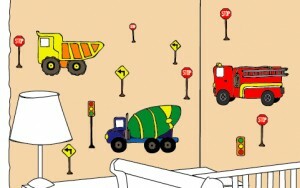 4 comments to Just released – latest wall decal designs! LOVE the trucks…. gotta have ‘em for my 20 month old grandson!!! 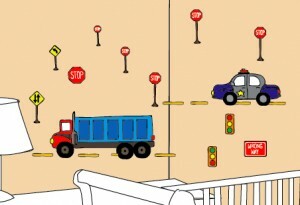 To Peggy: Have fun with the big trucks – vroom vroom! And thanks for your comment. Love the diapers! I’m curious and waiting for their arrival on the market. And looking forward to more amphibians, too. Fun! I love the girl pirate design! Makes me (slightly) wish I had a girl!